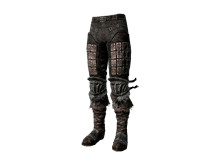 Leggings worn by Alva the Wayfarer. Light but offers very high defense. but failed and relinquished his knighthood. Sold by Maughlin the Armourer after you have spent at least 15,000 souls at his shop. Part of the Alva Set.